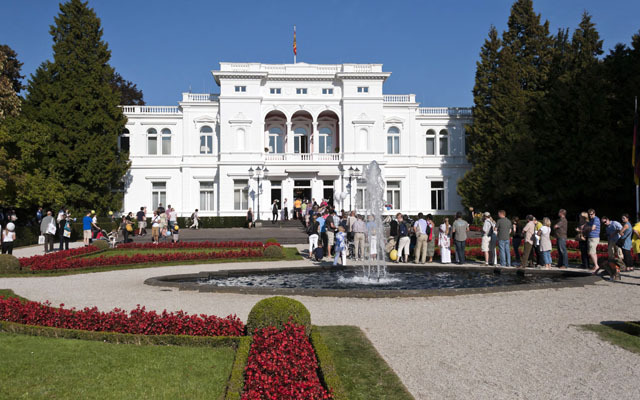 On Sunday, June 24th, 2018, UNU-EHS will be involved in the Open House at Villa Hammerschmidt in Bonn, Germany. Located in Bonn, Villa Hammerschmidt is the second official residence of the German President and it houses both state rooms and a private apartment. It is not usually open to the public, but on this day between 11.00 a.m. and 6.00 p.m. visitors are invited to get to know the property. Tour guides will take them through the building. In addition, both German and international research institutions have been invited to present their work in the park of the villa. Institutions such as the University of Bonn (which celebrates its 200th anniversary this year), the Bonn Center for Conversion (BICC) and United Nations University will offer activities that guests can participate in. There will be more than 20 pavilions around the property that allow visitors to learn about topics such as the food of the future, mobility, health, environmental topics as well as of course the work of the German President. Guests can also enjoy podium discussions and live music on a stage as well as activities for children. UNU-EHS will be represented in two different pavilions on the lawn in front of the mansion. In one it will present its work as a member of the Bonn Alliance for Sustainability Research. UNU-EHS was one of the founding members of this alliance of research institutions in the greater Bonn area and it will showcase research on the topic of mobility and migration. The second pavilion is on the future of Africa. Here, UNU-EHS will showcase its projects in Africa. Visitors will be able to engage in an interactive presentation and several games, including a game that introduces them to the use of GPS systems.